Much of Carlisle's 2,000-year history has been based on its military and political importance, thanks especially to the colonising power of the Romans and the Normans, and the needs of national defence against the Scots during the later Middle Ages. The end of protracted Anglo-Scottish hostilities altered the dynamics of the city's development in significant ways, and it slowly transformed itself from a small-scale manufacturing and market centre into the bustling industrial and railway conurbation of the nineteenth and twentieth centuries. 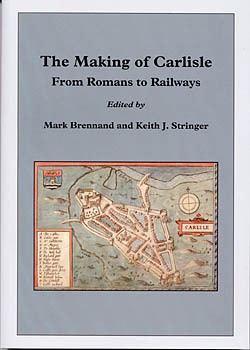 The contributors to this book bring to bear their expertise as archaeologists and historians to provide an up-to-date and readily accessible account of the major themes of continuity and change that marked the experiences of Carlisle and its inhabitants - be they Roman or Romanised townfolk, medieval soldiers and churchmen, or the entrepreneurs and ordinary people who responded to the challenges and opportunities of the Victorian era. Thier imprints can be traced not merely in written sources, for even today Carlisle resonates with the physical reminders of its past from the earlies times onwards. The city's exceptionally rich heritage deserves to be better known and understood, and this book will interest all who wish to learn more about the history of Carlisle and its place as the regional capital of Cumbria.